This breathe taking cubic zirconia wedding engagement ring features a 0.1 carat Round Brilliant Cut center stone with rhodium finish to prevent the sterling silver wedding engagement ring from tarnishing. On the day you say "I do", slip this exquisite wedding band on her finger and make it official with a kiss. 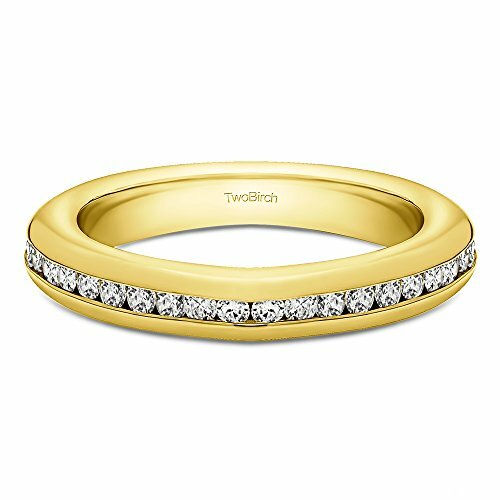 Fashioned in sleek and high quality metals, TwoBirch wedding bands are the epitome of quality and design. Set in solid Yellow Plated Sterling Silver and mounted with the highest quality of Cubic Zirconia, it's a stunning expression of your ever lasting love. TwoBirch takes pride in selling rings that are solid, not hollow. This makes these spectacularwedding bands and fashion rings perfect to wear every day and last a life time. Nothing says forever like this beautiful Classic Curved Style Ring Guard. Add it onto your solitaire, three stone ring, or halo engagement ring to create the perfectly stunning bridal ring guard set. Made in the highest quality of Sterling Silver and set with the most brilliant and vibrant Cubic Zirconia you can imagine, this ring guard enhancer will blow you away. 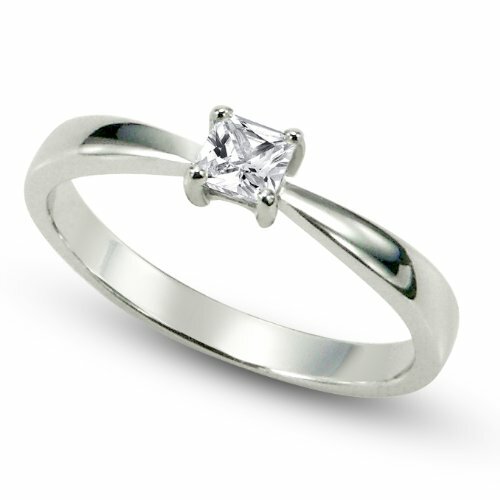 At TwoBirch, everything we sell is made to order, so while this ring enhancer is made to fit a standard solitaire, it can be made to fit your ring at no charge. You can simply select the PerfectFit option. Pressed for time? No worries. Email us images of your ring and we will modify your ring enhancer at no charge. Contact us for more details. At TwoBirch, we build or jewelry to last a lifetime. Our rings are solid, not hollow, and with simple care, will last a lifetime. 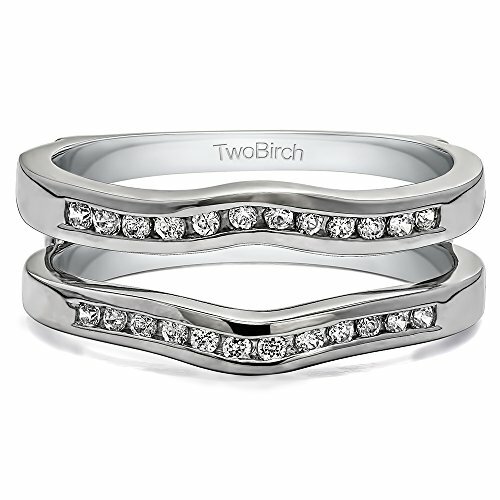 Set in Sterling Silver with gorgeous Cubic Zirconia, you will be amazed at how beautiful your TwoBirch jewelry will be. Nothing says forever like this beautiful Cathedral Infinity Designed Ring Guard. Add it onto your solitaire, three stone ring, or halo engagement ring to create the perfectly stunning bridal ring guard set. 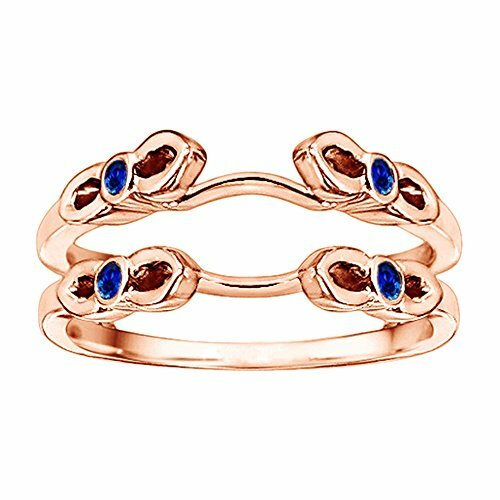 Made in the highest quality of Rose Gold Plated Sterling Silverand set with the most brilliant and vibrant Sapphire you can imagine, this ring guard enhancer will blow you away. At TwoBirch, everything we sell is made to order, so while this ring enhancer is made to fit a standard solitaire, it can be made to fit your ring at no charge. You can simply select the PerfectFit option. Pressed for time? No worries. Email us images of your ring and we will modify your ring enhancer at no charge. Contact us for more details. At TwoBirch, we build or jewelry to last a lifetime. Our rings are solid, not hollow, and with simple care, will last a lifetime. Set in Rose Gold Plated Sterling Silver with gorgeous G-H I1-I2 Diamonds and Sapphire, you will be amazed at how beautiful your TwoBirch jewelry will be. Copyright © Wholesalion.com 2019 - The Best Prices On 0.1 Ct Tw Band Online.